At some point when a production is close to wrapping, filmmakers can find themselves wondering if the genre they thought their film was held to, was actually the case. Crafting a bunch of footage into a meaningful film can mean sacrificing elements the writer had in mind with a more fitting vision; depending on the final take on scenes, line delivery and even a general atmosphere. Sometimes though, half the fun is including different elements into a single production. That's the case with Inheritance. This short dabbles in the standard dramatic genre, the supernatural and even thriller-ish elements. Or does it? The real beauty of writer / director Barak Shpiez's work is that the very genre itself is up for debate. Are supernatural elements in place? Maybe they are; on the other hand however, maybe these elements could be explained medically or simply chalked up to bad dreams. The point is that it's all open for discussion and nothing is concrete. Like I wrote above, that's the beauty of this production. Labeling it a certain genre can be debated and won or lost depending on the mind set of the viewer. An excellent quality for a short film indeed. The lensing of Inheritance was performed by Andrew Kelemen and done to great effect. The style and skill you want to see is present and accounted for. Nothing jaw dropping but totally directed at complimenting the story and never trying to hide flaws. The mark of a great cinematographer is knowing when to be flashy and when to be subtle. A bang up job all around. The general pacing and video editing was performed well and Inheritance moves along at a great pace showcasing the onscreen action. Enhancing Inheritance and completing it's excellent post work is a nicely recorded and mixed audio track. Indie flicks are notorious for bad audio, but you won't find any here. Some real attention to what we hear was put in as was the seemingly perfect scoring tracks laid down. I was more than glad to have been able to pick up the dialog without having to "Rewind" a scene 3 or 4 times. Excellent job. Rounding things up, the cast bang out mostly positive performances with Bingo O'Malley and Adrienne Wehr showcasing their acting chops to great effect. The Leads come through loud and clear and more than make up for some of the weaker (but not bad) performances from the supporting actors. Truth be told, there's not much to complain about when it comes to the acting so I think I'll just leave this as a job well done. Inheritance was a splendid whirl through the life of one who could be any of us. Bad choices, growing old and family issues are the heart of this short. Throw in a spattering of weirdness (don't want to give much away) and shake around for a while. What you're left with is a short film that leaves you wishing it was longer. I don't hand out scores of above 4 lightly but in this case I felt I had no choice. This is what Indie film... scratch that... this is what film is all about. 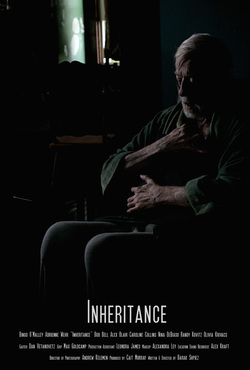 Entertaining the viewers any way you can and in that respect, Inheritance earns it's solid score from me.